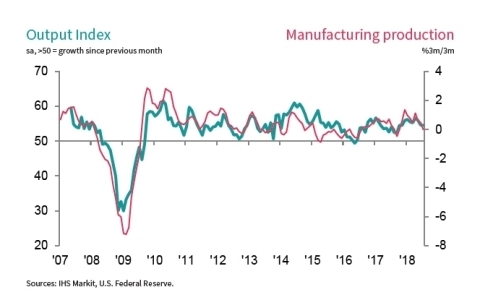 "The US manufacturing sector continued to expand in July, but shows increasing signs of struggling against headwinds of supply shortages, rising prices and deteriorating exports." LONDON--(BUSINESS WIRE)--U.S. manufacturing firms signalled a strong improvement in operating conditions in July, despite the headline PMI falling to a five-month low. Weaker rises in output and employment were seen in July, while export sales fell for the second month in a row. Meanwhile, companies reported the greatest deterioration in vendor performance since the series began and a faster rate of input cost inflation. That said, business confidence remained strongly positive, and was supported by hopes of further increases in overall new orders. 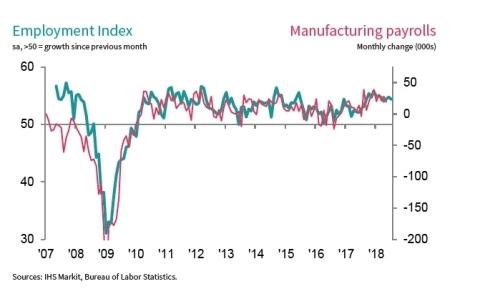 The seasonally adjusted IHS Markit final U.S. Manufacturing Purchasing Managers’ Index™ (PMI™) registered 55.3 in July, down slightly from 55.4 in June. Overall, the latest improvement in the health of the sector was the joint-weakest in 2018 to date, but remained strong in the context of historical data. Production continued to rise across the U.S. manufacturing sector in July, extending the current sequence of growth that began in June 2016. Where an increase in output was reported, panellists linked this to greater client demand and larger new order volumes. Although the rate of expansion was strong overall, it was the slowest since November 2017. New order growth, however, continued to outstrip that of output. The latest upturn in new business matched that seen in June and was strong overall. Anecdotal evidence suggested the rise was due to the acquisition of new clients and favourable demand conditions. That said, growth was largely driven by the domestic market, with foreign demand falling fractionally for the second successive month. In line with a sustained upturn in new orders, backlogs continued to rise solidly in July. On the employment front, panellists commonly reported difficulties filling current vacancies, with the rate of job creation softening despite increased pressure on production capacities. Pressure on supplier chains also intensified, as highlighted by delivery times lengthening to the greatest extent since the series began. Increased demand for inputs was exacerbated by firms reportedly stockpiling raw materials. Moreover, the rate of input price inflation accelerated to the third-fastest since March 2012 and was sharp overall. Firms also commented on efforts to pass costs onto clients through higher prices, with the rate of charge inflation accelerating to the fastest since June 2011. However, some stated that competition between firms weighed on overall pricing power. Difficulties in sourcing raw materials also fed through to a weaker rise in purchasing activity. That said, signs of stockpiling were evident in a faster increase in pre-production inventories, which rose at the quickest pace since January. Finally, expectations regarding the outlook for output over the next year improved in July. Confidence was largely attributed to new product developments and more favourable demand conditions. 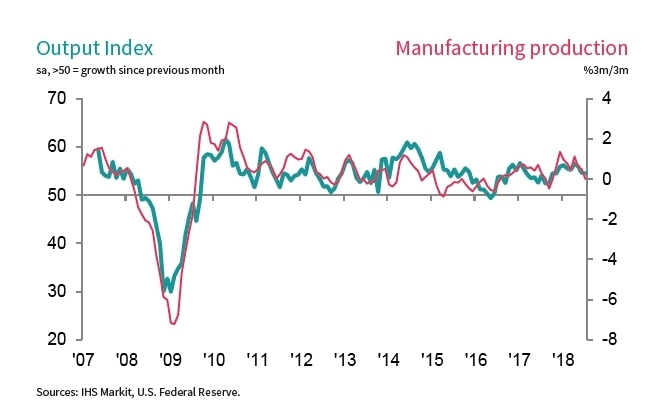 “The US manufacturing sector continued to expand in July, but shows increasing signs of struggling against headwinds of supply shortages, rising prices and deteriorating exports. 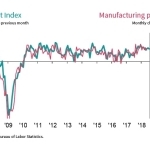 "The latest survey showed output rising at a rate roughly equivalent to an annualised 1% pace of expansion, which is the weakest since late last year. While a weakening of new export orders for a second successive month suggested foreign demand has waned compared to earlier in the year, the slowdown can be also in part attributed to increased difficulties in sourcing sufficient quantities of inputs. Suppliers’ delivery delays were more widespread than at any time in the survey’s history. With producers often scrambling to buy enough raw materials, suppliers enjoyed greater pricing power. Not surprisingly, with tariffs also kicking in, cost pressures spiked higher again. "Some relief for manufacturers came from strong domestic demand, which meant firms were increasingly able to pass higher costs on to customers. Average prices charged for goods consequently rose at the steepest rate for seven years, which is likely to feed through to higher consumer prices in coming months." 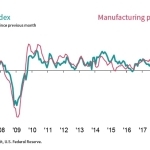 The IHS Markit US Manufacturing PMI™ is compiled by IHS Markit from responses to questionnaires sent to purchasing managers in a panel of around 800 manufacturers. The panel is stratified by detailed sector and company workforce size, based on contributions to GDP. Survey responses are collected in the second half of each month and indicate the direction of change compared to the previous month. A diffusion index is calculated for each survey variable. The index is the sum of the percentage of ‘higher’ responses and half the percentage of ‘unchanged’ responses. The indices vary between 0 and 100, with a reading above 50 indicating an overall increase compared to the previous month, and below 50 an overall decrease. The indices are then seasonally adjusted. 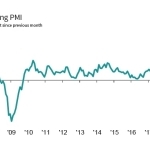 The headline figure is the Purchasing Managers’ Index™ (PMI). The PMI is a weighted average of the following five indices: New Orders (30%), Output (25%), Employment (20%), Suppliers’ Delivery Times (15%) and Stocks of Purchases (10%). For the PMI calculation the Suppliers’ Delivery Times Index is inverted so that it moves in a comparable direction to the other indices. Underlying survey data are not revised after publication, but seasonal adjustment factors may be revised from time to time as appropriate which will affect the seasonally adjusted data series. July 2018 data were collected 12-25 July 2018. For further information on the PMI survey methodology, please contact economics@ihsmarkit.com. IHS Markit (Nasdaq: INFO) is a world leader in critical information, analytics and solutions for the major industries and markets that drive economies worldwide. The company delivers next-generation information, analytics and solutions to customers in business, finance and government, improving their operational efficiency and providing deep insights that lead to well-informed, confident decisions. IHS Markit has more than 50,000 business and government customers, including 80 percent of the Fortune Global 500 and the world’s leading financial institutions. IHS Markit is a registered trademark of IHS Markit Ltd. and/or its affiliates. All other company and product names may be trademarks of their respective owners © 2018 IHS Markit Ltd. All rights reserved. 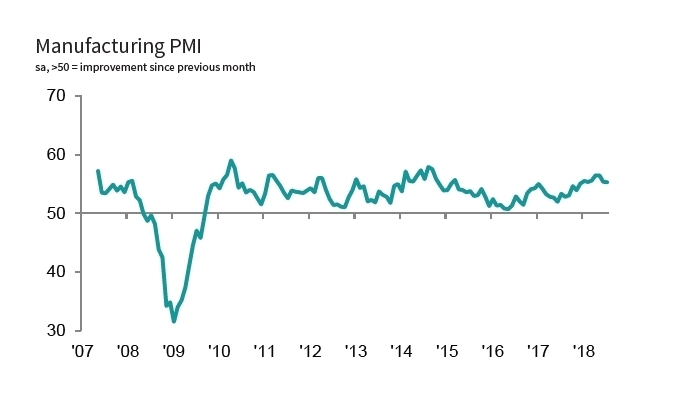 Purchasing Managers’ Index™ (PMI™) surveys are now available for over 40 countries and also for key regions including the eurozone. They are the most closely watched business surveys in the world, favoured by central banks, financial markets and business decision makers for their ability to provide up-to-date, accurate and often unique monthly indicators of economic trends. To learn more go to ihsmarkit.com/products/pmi.html. The intellectual property rights to the data provided herein are owned by or licensed to IHS Markit. Any unauthorised use, including but not limited to copying, distributing, transmitting or otherwise of any data appearing is not permitted without IHS Markit’s prior consent. IHS Markit shall not have any liability, duty or obligation for or relating to the content or information (“data”) contained herein, any errors, inaccuracies, omissions or delays in the data, or for any actions taken in reliance thereon. In no event shall IHS Markit be liable for any special, incidental, or consequential damages, arising out of the use of the data. Purchasing Managers’ Index™ and PMI™ are either registered trade marks of Markit Economics Limited or licensed to Markit Economics Limited. IHS Markit is a registered trademark of IHS Markit Ltd. and/or its affiliates.